West Ham vice-chairwoman Karren Brady says London Stadium should be making money – not incurring huge losses. Brady disputes figures from stadium owners the London Legacy Development Corporation, who say it costs taxpayers up to £250,000 for each West Ham match. Speaking to a London Assembly hearing, Brady says it is “hugely frustrating” that offers of help have been rejected. She said “nobody” at the group responsible for running the stadium had any expertise in that field. Brady said that on matchdays, the stadium was “generating millions of pounds”, adding: “There should be a surplus. “We would like more control over our matchdays, no one knows how to do that more than us. When we first wanted to move in, we offered to buy the stadium, and we would have been responsible for all costs and that was rejected. “London Stadium craves direction, it should be a jewel in the crown. It needs financial control, it needs investment, it has nowhere near reached its potential and that’s incredibly frustrating. London Stadium still has no naming rights deal in place, even though Brady said it should be “relatively easy” to negotiate. Brady did confirm agreement had been reached to replace the green carpet that covers the running track at the venue for the 2012 Olympics and that this would “predominantly” be claret. BBC Sport understands West Ham are paying an increased annual rent as part of this agreement, which will also include a statue outside the stadium and the opportunity to name a stand after one of their former players. 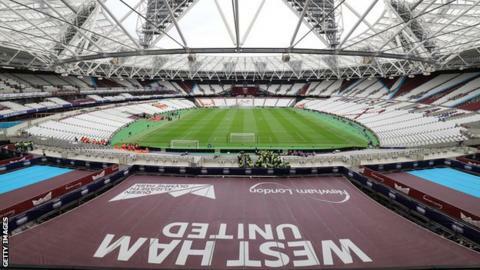 The stadium has been dogged by controversy over its finances with disputes between LLDC and West Ham also costing the taxpayer £4m in legal fees. Brady said that could be doubled if LLDC lose another court case surrounding the capacity of the stadium set for next month. West Ham argue their agreement is for a 60,000-capacity stadium. It is currently 52,000. Converting London Stadium into a football ground cost £323m when the original estimate was £190m. And although West Ham pay an index-linked annual rent that has now reached £3m-a-year, the venue is still set to lose £140m over the next 10 years. But she then stated that the club “did not want to find ourselves in the same situation as [stadium organisers] E20″ because of the existing commercial deals at the stadium, including the cost of changing the seating for athletics events, which now runs into millions of pounds when the original estimate was £400,000.